Walgreens Easter Caramel Egg: I actually had to search really hard to find out who made this little guy. If you unwrap the foil really carefully, you’ll find that Walgreens claims credit in the teeniest tiniest print possible, way down at the very edge of the foil. That was my first clue that this was maybe not gonna be a great egg. When I bit into the egg, I found it had a really thick chocolate shell. You’d think with such a whomping amount of chocolate in the shell I’d be doing the happy dance. But it turned out that the chocolate wasn’t particularly chocolaty and its texture was pasty. Bummer. Inside, I found a small amount of caramel hanging out in the very center. The caramel wasn’t very thick but had a light liquid consistency. The buttery flavor was nice, but it needed more of that. Overall, my impression here was SWEET. I’d have preferred more flavor with the sugar. 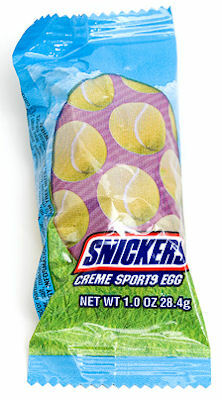 Snickers Creme Sports Egg: Actually, it’s half an egg. It’s not fully rounded like the Walgreens egg – the bottom is flat. If you have trouble fitting a whole egg in your mouth, a half-egg might be easier to eat. You can get these babies in various sport-themed wrappers. I picked tennis balls because the cheery yellow reminded me of Easter, but you can go for footballs or baseballs if that blows your skirt up more. When I opened the wrapper, I got a whiff and thought “Peanuts! Yay!” And that’s the theme with this egg. I thought I’d be getting an egg-shaped Snickers but really this is egg is way sweeter and much heavier on the peanuts and peanut butter than a regular Snickers. I really liked all the peanuty goodness, I just wished they’d tone down the sugar a little. 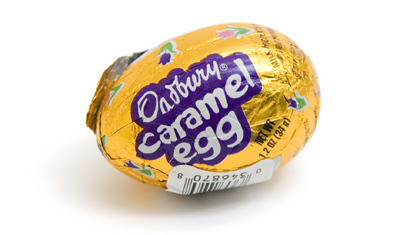 Cadbury Caramel Egg: If you’ve read any of my other articles, you know by now that I LOVE Cadbury. I expected my Cadbury egg to be something along the lines of Cadbury’s Caramello. I’m so sorry to tell you that this is not the case. On the plus side, the caramel in this egg rocks. As soon as you start to uncrinkle the foil, a rich caramel smell starts wafting out. 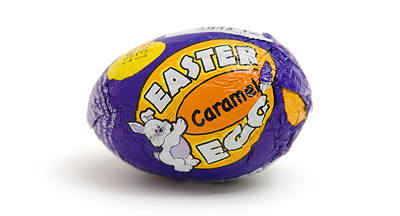 And when you bite into the egg, you find it’s loaded with rich, luscious caramel. It’s sort of liquid, like the Walgreens egg, and just loaded with butterscotch flavor. Really yummy. The downside to this egg is that you don’t get the usual rich Cadbury chocolate flavor for the shell. The shell is pretty thin – the better to make room for that awesome caramel – but it doesn’t taste like regular Cadbury chocolate. It’s much sweeter and they’ve somehow lost the earthy richness I love in Cadbury chocolate. Russell Stover Caramel Egg: People, I gotta tell you this one good egg. Like the Snickers, it’s a half egg. Like the Cadbury, the second you unwrap it, the caramel scent reaches out to greet you. And it only gets better. Russell Stover got both the chocolate and the caramel right. The chocolate is more along the lines of what I expect from Cadbury. It’s still on the sweet side, but the quality of the chocolate balances the extra sweetness. Oooh, and the caramel… it’s thick! And there’s tons of it! It’s like they painted a light layer of scrumptious chocolate on top of an egg made of butterscotchy, rich caramel yummy goodness. This was definitely my favorite egg! If you use these in an Easter egg hunt, they are worth the effort of finding them. i bought the cadbury caramel eggs in the mini size. they come in a little plastic sort of egg carton container. anyway, the small ones are way better than the big ones. i thought the proportions were better, as well as the chocolate quality. i also prefer the little cadbury creme eggs too. i got them at walgreen’s. 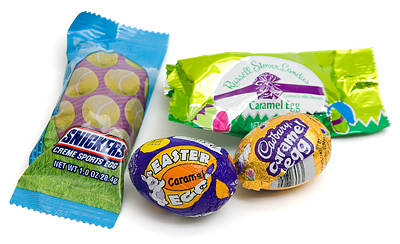 Hmm – here in Canada, we have Caramilk eggs to go with the Cadbury Caramilk bar. I wonder if they’re the same as your Cadbury caramel egg?